In response to a couple of my friends’ requests, I have revised the post to include a few more details about the summit day and the descent. I hope that those of you, who wanted the last installment in the Manaslu series to be ‘more’, are now ‘more’, if not entirely, satisfied ;). The Junkies left Camp 4 for the summit at 2 am. It was a cold night. The trail to the summit from the day before had been almost entirely erased by the strong wind, and I would hardly have found my way across even the first of the wide plateaus above Camp 4, if it wasn’t for following my climbing Sherpa, Pasang Wongchu. There were a few clouds in the otherwise clear sky, and an occasional flash on the horizon, ahead and to the right of us. The flashes were extremely bright and vast, which made me believe they were lightnings, but it was quiet around us, and my heartbeat, heavy breathing and the creaking of the solidly-packed snow under crampons were the only sounds in the world. ‘Please, don’t let a storm start,’ I begged somebody somewhere, ‘not now! 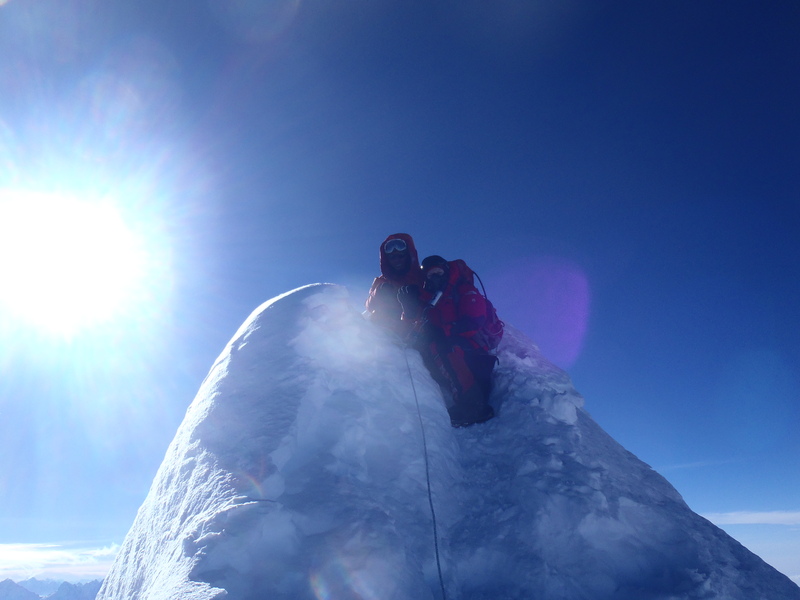 Not after all that, not when I’m this close to the summit…’ as if summiting would make ‘all that’ go away. Just like I’d hoped it would, oxygen made climbing easier for me than it had been the day before. I was quite alert and, at first, even warm, but that illusive warmth lasted me precious little in the strong wind. We moved relatively slowly, and I enjoyed the feeling of not being in a race: I was almost certain I would make it – until my toes began to freeze; they would not warm up now, no matter how much I wiggled them in my boots. I would look up at the sky frequently, waiting for at least a hint of dawn, and when I could finally see it, I felt calmer, but even colder. The pre-sunrise hour is always the iciest hour of the night, but I had no warmth left to give. We’d been moving steadily: I could already see the false summit, and was getting near it as the blue air gradually filled with light. By then, in spite of the very reasonable pace, I was tired. Two team mates had passed me with their Sherpas. As I lingered at another stop, with the traverse to the sharp summit ridge within reach, I was searching for but finding no energy or even desire to make the final push. I still don’t quite know why it was that, after walking in the night, occasionally bending double to hide from the gusts of the angry wind, after living through nightmares, after days of cold and exhaustion, now, on the vertiginously narrow ridge leading up to the true summit, I didn’t want to carry on to the end. Minutes later, crouching on the small top of the stunning Spirit Mountain and tying khatas for friends to the string of prayer flags, I felt the opposite of joy. In the summit snow I buried a photo of Christophe, to whom I had dedicated my climb, whispering as a prayer the words of ‘I Promise‘ – the poem his partner had recited at his funeral just a month earlier. There was no sense of accomplishment when I fell silent and looked at the impressive peaks below me or into myself, just loneliness as big as the frozen, timeless space all around. I’d silenced my shame of surviving where so many died, and stepped over them but also over myself to be standing where I was now. I wasn’t sure, however, that I had the heart to retrace my steps back ‘home’. I left the summit quickly, forgetting to look at the team mates I passed on the descent from the ridge. After the ridge came the exposed, windy traverse, which had scared me on the way up but which was now a welcome sight. ‘If I fell here, it would be an accident…’ I thought, stopping, considering my ‘options’: there were no ropes to keep me, nor, frankly speaking, much else. I didn’t want to have to celebrate my dubious ‘conquest’ at base camp – I may have wanted what I’d ‘conquered’ but I certainly missed what I’d ‘defeated’ in the process. I looked down but, suddenly, my climbing Sherpa turned to me and, reaching for my safety sling, clipped it into his own without a word. I hated him then for his impeccable timing because now I couldn’t fall, and would have to tread carefully. Fixed lines, which began after the traverse, re-connected me with reality, pulling me out of my grim dream. Climbers on their way up, friends and strangers, nodded their mask- and hood-covered heads and patted me on the shoulder. They reminded me of the fact that across the long slopes and wide crevasses between the summit and base camp, there were real people, not ghosts, waiting for me. And if they keep waiting, then, I cannot fall. The descent from the summit back to Camp 4 took us little time. The air had warmed up, but the wind was growing stronger. We could not afford to linger at Manaslu’s highest camp as the weather forecast had predicted a serious increase in wind speeds in the afternoon, but we would still take a couple of hours to rest in the tent and boil some water. Our destination for the day would be Camp 2, given that base camp seemed impossibly far away for how tired we were. E and I both decided not to use oxygen on descent so as to have lighter backpacks; I also wanted to get rid of the gas mask, which hindered my sight somewhat, especially coming down. E left before me and Pasang, and I would only follow reluctantly when the Sherpas started taking down the tents to carry them to Camp 2. Walking without oxygen proved hard, and I was very slow, so Pasang insisted I use it in spite of my protests: ‘I have no space in the pack!’ The oxygen bottle took the place of my sleeping bag, which was now tied on the outside of the Sherpa’s backpack, already ‘heavily decorated’ with other group and personal gear. I felt like the biggest, most useless whinge stumbling behind him, a little more lively now thanks to the O2. Just minutes later we caught up with E, and continued the descent together. After briefly resting at Camp 3, where I could finally stop using oxygen, we staggered down to 2. On our way we passed a small group of Sherpas, who had recovered another body from under the avalanche debris, and were preparing it for evacuation. I felt lucky to be short-sighted, but even luckier to have a tired heart. 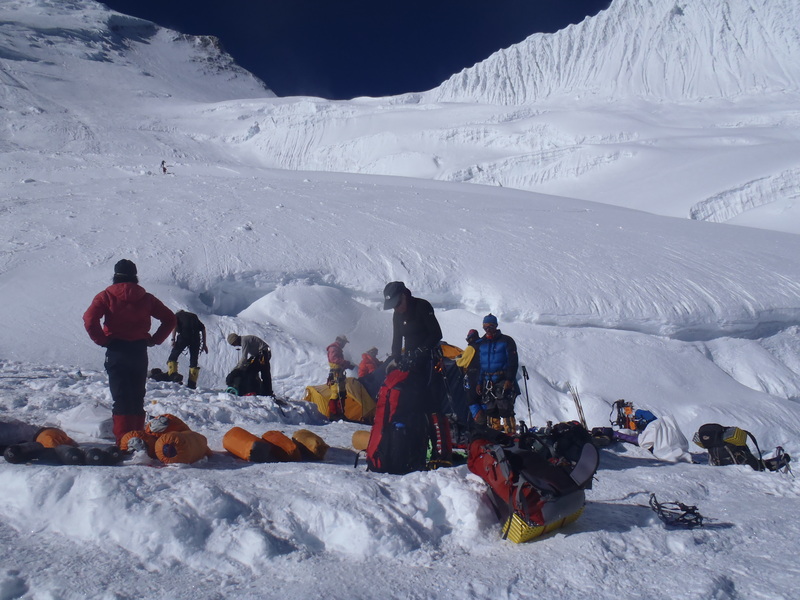 As we approached Camp 2, I heard an all-too-familiar sound – an avalanche on a nearby slope. It was small, ways away, and the trail was completely safe from it, but I still shuddered. ‘A few hours ago you considered walking off into thin air, and now you’re scared of an avalanche? What a little hypocrite!’ I said to myself as we began moving again. Camp 2 was already in the shade when we reached it; it was going to be a cold evening. In the tent the trio shared what was left of our food supplies to make ‘dinner’ and went to sleep at about 7 pm. I had worried about spending one more night at Camp 2, but neither tears nor nightmares would disturb me – I was fast asleep before I knew it after the long summit day. 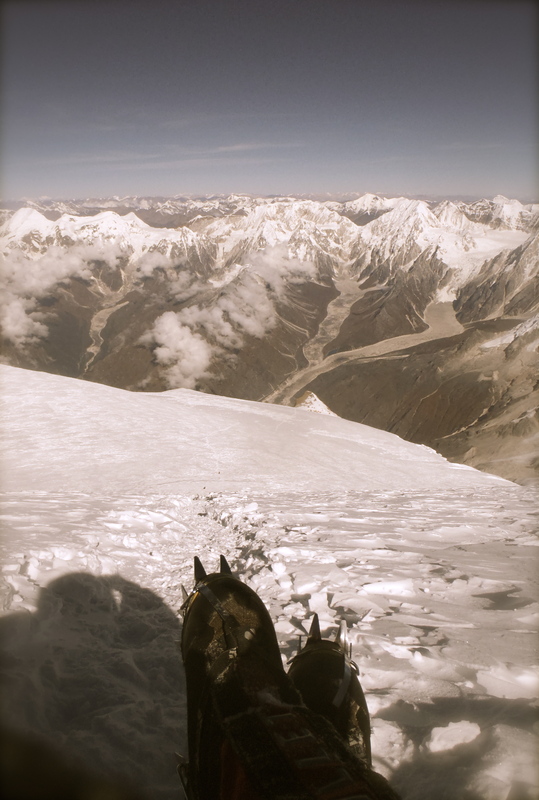 In the morning we packed up Camp 2 and began the descent to base camp. Concerned about the wide crevasses, which cut through our route, Phil would lead the team down himself, and we would all climb together. In spite of the precautions, two of us couldn’t help exploring the insides of two different crevasses; yours truly, of course, had to be one of them. Fortunately, one of the Junkies had a ‘magic sling’ to help out climbers in just such embarrassing situations, and that day the sling came in very handy indeed. Passing Camp 1, where I loaded my backpack with more gear, we soon arrived at Crampton Point. There our kitchen staff were already waiting with tea, juice and a can of Red Bull for me. 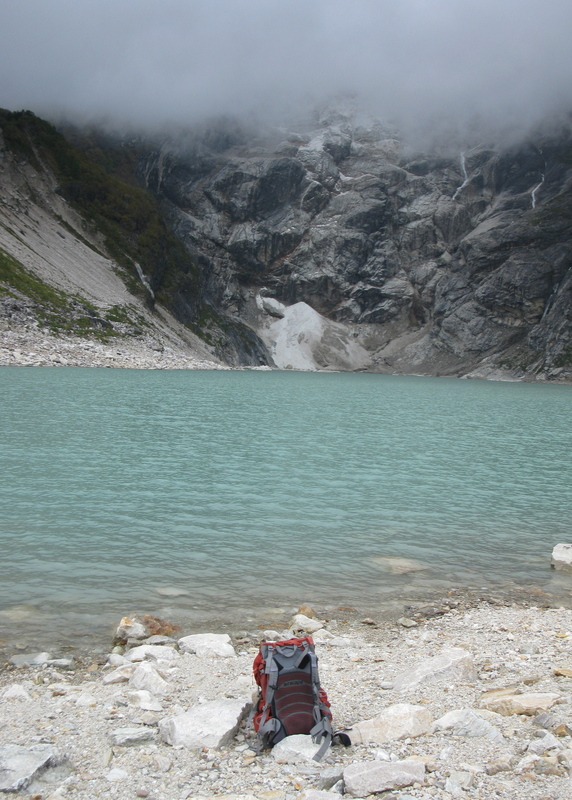 I was surprised and somewhat disappointed at how energetic I felt, when we reached base camp a little later. 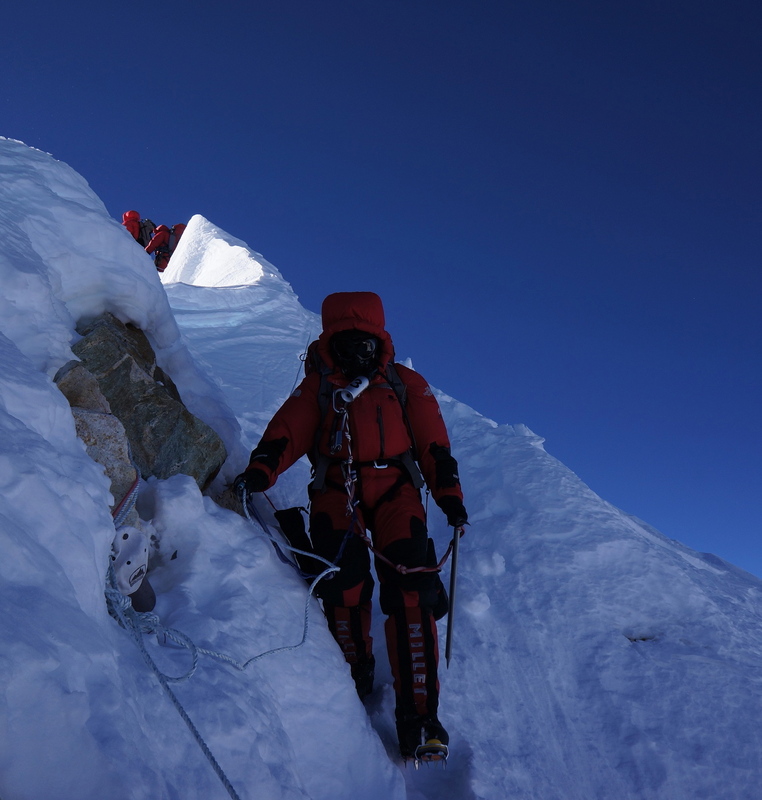 I felt nothing like after summiting Everest, the descent from which had been so unbearably exhausting. Paradoxically, I felt physically stronger now, after returning from the summit, than I had when I first arrived at the foot of Manaslu. I remembered, however, my little episode on the traverse, and it worried me that I should have let myself grow so mentally tired and weak that such thoughts as I had would even come into my head… I knew that I could still trust my body to do what was required of it more or less efficiently. Could I also trust my mind not to yield under the pressure of all-too-many memories and fears? At base camp we had a beautiful celebration, with champagne and laughter, and, in spite of my expectations, it felt good and right to be celebrating a summit. I was grateful to Phil and the whole Altitude Junkies crew for providing me and the rest of the clients with the opportunity and the support to reach the top and descend safely. The expedition had been an intense experience, and, ultimately, a very positive one. It took away yet another of my 9 lives, but gifted me with an increased appreciation of the remaining one(s), and another 8000-meter summit. I was glad to have stood on the tiny top of Manaslu, which I had not been able to do a year earlier. 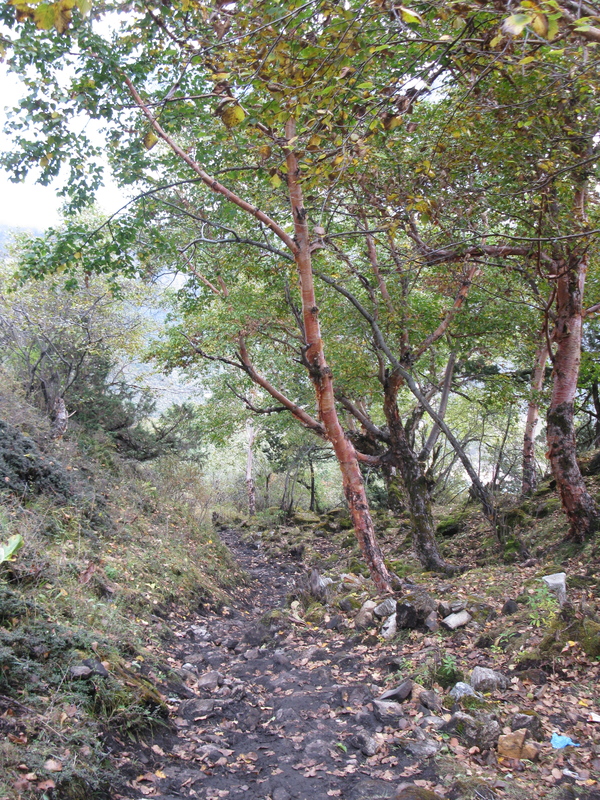 When I left base camp and at last allowed myself to walk all the way down the trail to Samagaon, I felt free and calm. However, I was missing the mountains, harsh and cruel as they sometimes are, even as I was walking away from them. I am back in Kathmandu, having left the high-altitude winter for the stunning autumn now reigning in Nepal. I am still processing my latest climbing experience but already preparing for the next one. This time I will do more than climb – and, hopefully, for more than my own pleasure. I will post an update about the new project in a couple of days. Thank you for ‘climbing’ with me on Manaslu! Drop by if you’re curious to learn about the upcoming adventure, and take care! Thanks for another breathtaking vicarious adventure…I look forward to the next project…hope you get some much needed rest. And thank you for reading and commenting! I think I’ll have to rest in the mountains as we are set to leave again soon :)! I feel exhausted after simply reading about your climb ! Thank you! It’s been a long story, hasn’t it? Sorry it tired you. As for the new adventure, not only am I talking about it – I should already start packing, really :)! Firstly congratulation for the Manaslu summit. This is the second post of urs that i am reading… Ur writings are truly amazing and mesmerizing. It simply takes readers to the world that u had experienced. I m so glad that u had made this trip. Congratulation once again and hats off for ur dedication and courage. Thank you! Glad you’re enjoying your reading here! Manaslu was a tough summit, but absolutely worth every effort I put into it. It was my second attempt, too, which made it both harder and easier at the same time. The Spirit Mountain gave me a lot!